On another note, I have now relocated my kombucha brews to my kitchen cabinet. For whatever reason, it has already been getting colder lately around Boston. (*sigh. * I wish it were still the middle of summer!) Since I tend to open my windows every now and then for the fresh air, my room can get chilly at times, too- which also makes for a slower kombucha ferment. Because my kitchen tends to be warm, it is a good location temperature-wise for my kombucha brew. 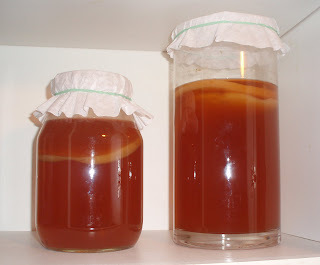 However, keeping your ferment in a cabinet in the kitchen is highly recommended- SCOBYs are not fond of smoke! And you might not want to keep your brew in too tight or small of a cabinet, either- kombucha mushrooms also like their oxygen! Overall, keeping your ferment in a closet or cabinet can be very helpful if you would like to set it aside in an undisturbed spot. Just remember not to forget about your brew! Hi tdowgiert, thanks for stopping by my blog! Happy Herbalist has a list of suggestions for what to do with extra kombucha/sour kombucha. http://www.happyherbalist.com/kombuchateatoosour.aspx. You may also considering giving, selling, donating, or bartering the extra kombucha you have. If you are interested in doing that, you could try connecting with family or friends, events/organizations/people in your area, or connecting with individuals through my Facebook page, Kombucha Fuel, at https://www.facebook.com/KombuchaFuel.